My view from the treadmill at the gym. Running east towards the Mekong River (which is at the top of this photo) is Sihanouk Blvd. 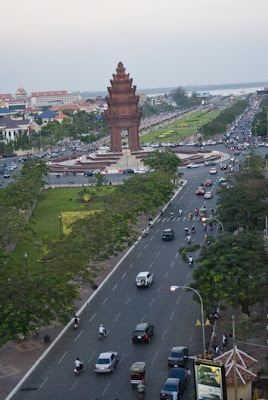 Independence Monument, commemorating the war dead and independence from colonial rule (France) in 1953, is at the intersection with Norodom Blvd. The parks on either side of the monument are hubs of activity. The street grid under French rule composed of wide main boulevards lined with trees. Fortunately the not-so-often wise leadership decided that this is an asset. The municipality has recently begun a spate of beautification projects around the city, making medians more inviting and family-friendly like this one. It's part of a wider effort at attracting tourism, as most visit the country for just three days-- all three of which is spent in Siem Reap's Angkor Wat archeological zone.